This kit has retired, but, we have upgraded it. Please CLICK HERE FOR THE UPGRADED AMARINO SHIELD. 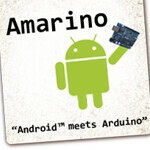 The upgraded version of Amarino is a better kit with additional features. Fully assembled kit is also available on buildcircuit.net. This is 8 bit shift register. The chip is used for decimal to binary conversion experiment. 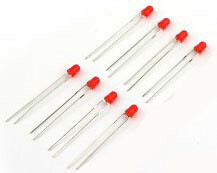 The LEDs are use for CD4094 experiments. This LED is used for Amarino- Sensor Graph Experiment. LM35- temperature sensor- 1 pc. LM35 is used for Amarino and remote temperature sensing experiments. 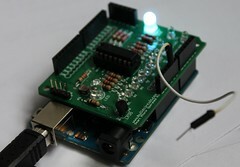 RGB LED is used for Amarino- RGB Multicolor Lamp experiment. LDR is used for Amarino- Sensor Graph experiment. Female header- 4 pin – 1 pc. Stackable headers- 6 pin header(3 pcs) and 8 pin header(2 pcs). 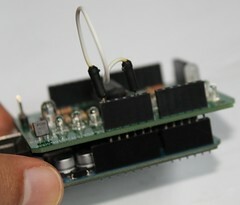 a. BlueSMiRF- Bluetooth Mate Silver – This module is cheaper than other BlueSMiRF versions. The shield works with other modules also, but you can only stack Bluetooth Mate Silver on to this shield. CD4094- 8 Bit shift register- evaluation circuit. Light dependent resistor ( LDR) based light sensor. Perfect for testing Amarino and all Android serial emulators. Provides space for BlueSMiRF mate silver and General Bluetooth adapter. 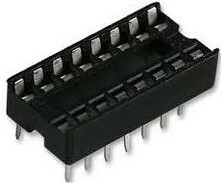 You can also use other adapters, but you need to connect those with Breadboard and extra wires. Works great with Arduino, with tons of example codes. Tested and verified at BuildCircuit.com Lab. 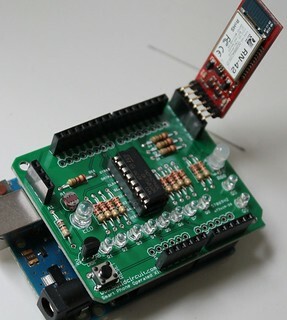 The shield has been designed to suit ARDUINO UNO R3 because of its placement of reset switch (just makes easier !). 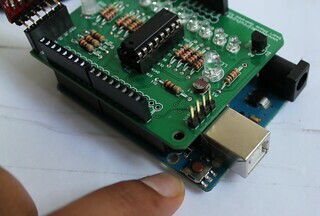 However, the shield works perfectly with other versions of Arduino also. In case you need to reset the shield, use a piece of wire and connect reset pin to GND for a short moment. 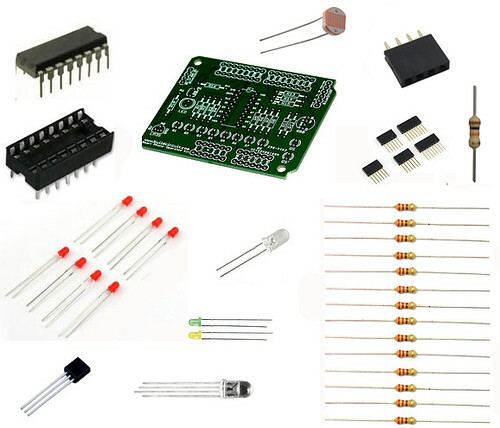 CIRCUIT LAYOUT- see how the components are connected to Arduino. LDR based light sensor data on Amarino interface.